Afternoon everyone! Quick little post while the little ones sleep. 😀 I created this mani last night – I was trying to do something interesting with these four and Sinful Colors Transforming Top Coat in Concrete Jungle but couldn’t make something work. Oh well! I rather thought this turned out like abstract flowers or something. If you’re interested in this technique, I did it similar to this tutorial from Yagala (pedicure warning!). Hello everyone! Today I have a simple manicure with KBShimmer Got It Sandaled [gift] and Alchemy Lacquers Sweethearts [purchased myself]. Posted in Indie Polish, Link Ups, Mainstream Polish, Manicures, Nail Art, pictures, reviews	by Jessica W.
Hi everyone! I have a special post for you today. Some of you may know Roselynn of Manicured & Marvelous; she’s a great blogger, nail artist, and all around cool person. She’s been having some health problems lately and I wanted to do something to cheer her up. I asked some other bloggers if they’d be interested in recreating her manis and everyone posting on the same day. So here we are! I’ve used 3 coats plus top coat of ILNP Daisy Jane on my pointer and pinky fingers. On my middle and ring fingers, I started with 3 coats plus top coat of Emily de Molly Learned Doctors. On my middle finger, I created a gradient with Daisy Jane and Learned Doctors. Then using OPI Black Onyx, I attempted to recreate the Barbie logo, but I think I kinda failed. I did do the same nail art on my Cinderella hand, but the Barbie logo looked like a knight chess piece. haha! I used straight vinyls from Polished Vino and ILNP Summer Crush on my ring finger, along with a bow charm from Polished Vino. BTW, I adore how the flakies of Learned Doctors coordinates so well with the micro flakies of Summer Crush! On my thumb, I used 3 coats plus top coat of Alchemy Lacquers Elixir No. 10. This was a small batch polish I was able to snap up and my-oh-my, am I glad I did! The sun was weak when I took this picture, but you can kind of see the holographic sparkle of Summer Crush and Daisy Jane! Please join me in sending Roselynn all your good thoughts, well wishes, and/or prayers as she continues to struggle with her health. Oh man, I can’t believe it’s almost February already. Yikes! I feel like I’ve done nothing all month – not true but sometimes I feel a bit aimless, you know? 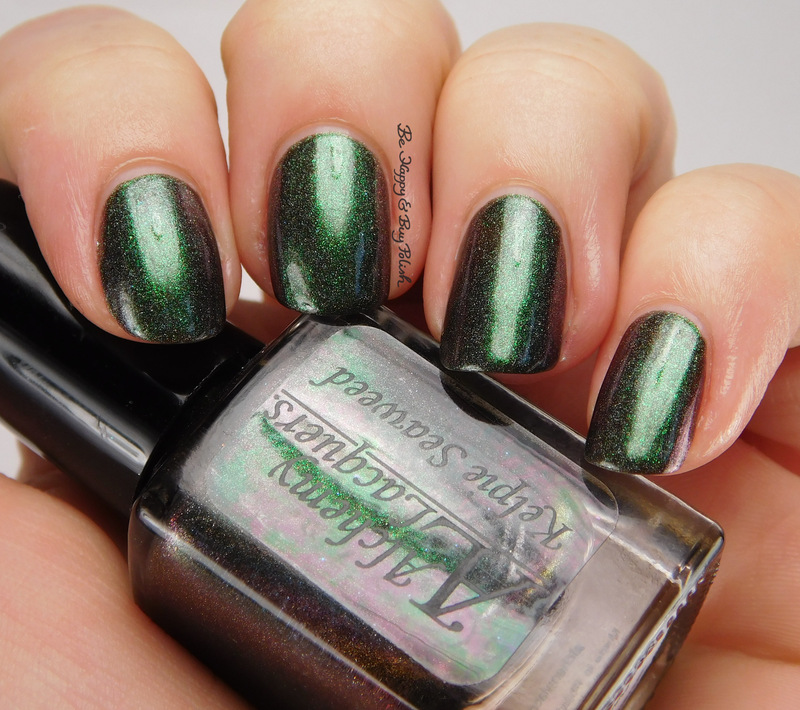 Nothing doing about today’s polish – Alchemy Lacquers Europa – but I had to share anyway! Formula was good – thick but workable. Just my kind of polish! This is 2 coats plus top coat. In person, there was a little of a sparkle to this polish, but I gave up trying to capture it fully on camera. Lastly, I just had to show you this shade photo! I love how beautiful the flakes look even in the shade. Europa is still available as of this writing, and Alchemy Lacquers was named as one of my outstanding brands of 2015, so if you haven’t yet tried them out yet, you should do so! Happy Saturday to you! Earlier this week I showed you Milani Mint Crush, and now I have Alchemy Lacquers King of Lost Hope to show you on top of that. As described by the maker: King of Lost Hope is a flake/glitter topper in a clear base that consists of green to purple shifting chrome flakes, orange to green shifting flakes, orange and purple flakes along with green and purple microglitter. This is 1 coat plus top coat over Milani Mint Crush (2 coats). The polish is so thick with flakes, it was a little hard to spread. So this could be used as a stand-alone polish but sometimes I like to layer polishes like these. 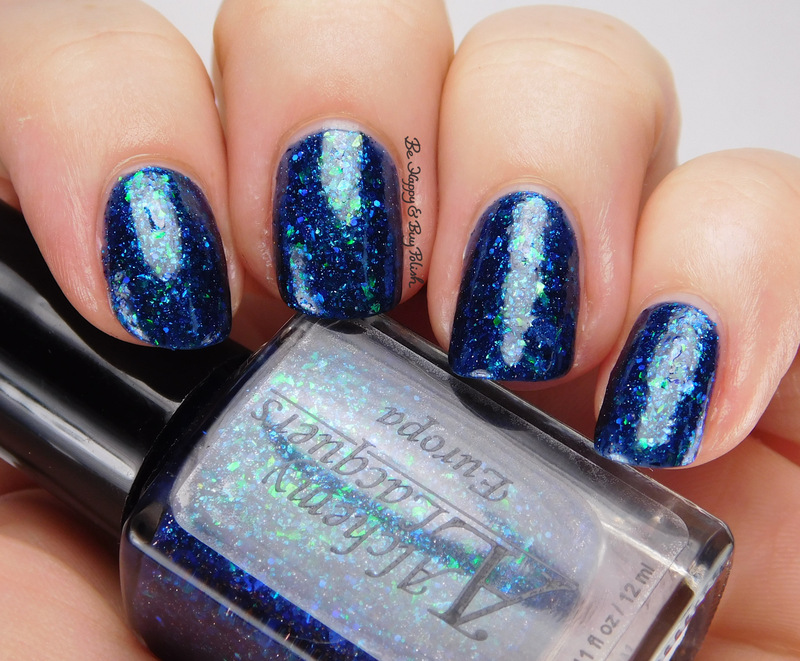 It looks like this is currently out of stock at Alchemy Lacquers, but you should go peruse her shop anyway because dayum does she have some pretty polishes! Good morning wonderful readers! Did you have a good weekend? We put our tree up yesterday but didn’t trim it yet, kind of ran out of time last night. Looking forward to it, I love keeping my tree up until Epiphany. 🙂 Anyway, today I have one of my first Alchemy Lacquers – Pink Peppercorn! Pink Peppercorn is a pale pink crelly base nail polish with hexes of neon pink, neon purple, neon fuchsia, neon coral and a hidden gold/pink/purple shimmer. This is 3 thin coats plus top coat. You’ll want to give each coat time to dry to prevent dragging. 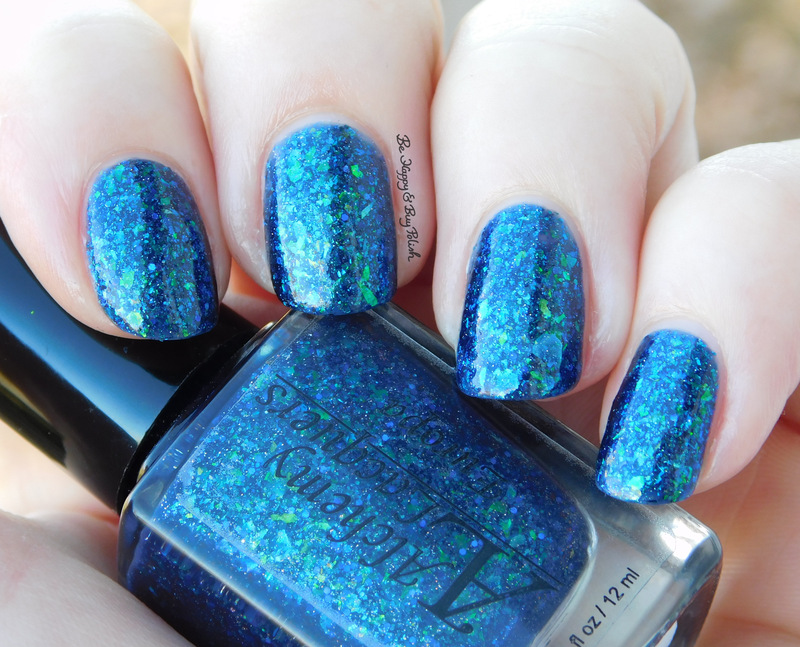 I love an interesting crelly polish and this is no exception! 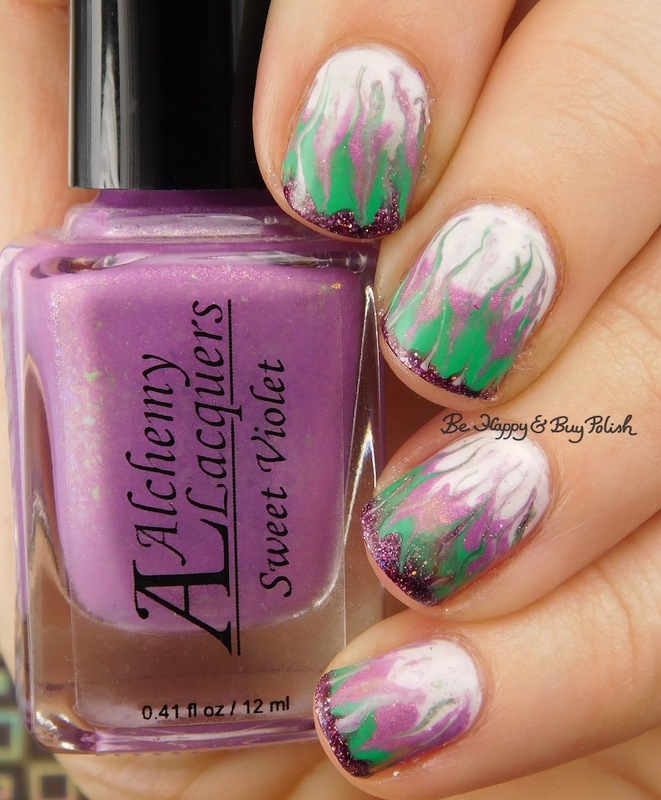 Alchemy Lacquers is one of my new favorite indie brands and they are reasonably priced. You can find them at their shop or on Facebook and instagram. Are you a crelly polish fan, or not? What’s your favorite finish?